Too Old for the Stage? 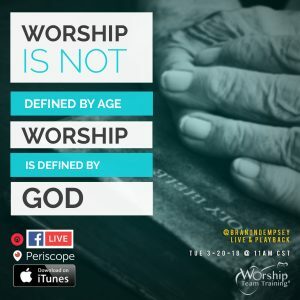 As a Worship Leader, do you sometimes struggle with comments about the age of people on the platform? They typically are that they are either too young, not young enough, or that someone is too old. Does age play a role in who should be on the stage? Is the goal to have everyone on the platform under 30? Is there a benefit to having all ages represented? Learn the benefits of having people from every generation represented in your church on the platform to lead.